Twenty-one Sheridan High School FBLA students competed at the District III FBLA Spring Leadership Conference in Pine Bluff on Wednesday, January 27. 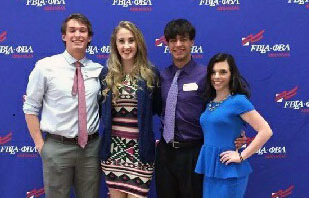 Future Business Leaders of America – Phi Beta Lambda (FBLA-PBL) is the premier student business organization in the world. FBLA-PBL’s mission is to bring business and education together in a positive working relationship through innovative leadership and career development programs. Picture Cutline; (l-r) Seniors Luke Squires and Rylee Marsh, Junior Brittany Osborn, and Senior Hunter Taylor.